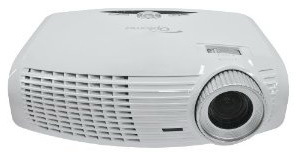 I’ve spent some time researching and shopping for affordable 1080p projectors for my home entertainment system the last couple of months and finally settled on the Epson PowerLite Home Cinema 8350 (V11H373120) 3 LCD projector (Specifications (PDF), User Manual (PDF), Image Size Calculator) that costs around $1150 for my budget home theater setup. I researched prices for the screen and projector from various companies to find the best deal with highly rated dealers. I found the projector on Amazon which is great because my dealings with Amazon and Amazon dealers have always been great. Choosing an HD projector was not an easy choice as there are quite a few projectors out there in this range with a wide variation of features. If you’re installation space allows you to use a DLP projector and you aren’t affected by the rainbow effect then you can get something for even less such as the Optoma HD20 1080p – (User Manuals, Quick Start Guide, Distance Calculator). I had seriously considered the HD20 as it has a lower price at around $950 but for reasons you’ll see below I went with the Epson 8350. Why Did I Choose 3 LCD over DLP? I had two options both in affordable ranges but after doing a bit of research I found that most of the DLP projectors in my price range did not have a lens shift feature. These are the little knobs you twist on the projector to move the picture up and down and left and right which was an important feature requirement to me. Because the low price DLP projectors don’t have lens shift adjustment you have to be very careful about where you place them. Low price LCD projectors on the other hand usually have at minimum up and down lens tilt. The 8350 has up / down and left / right lens tilt. Additionally the DLP projectors in this range did not have a wide zoom lens adjustment. You use the zoom lens to shrink or enlarge the image to fit your screen. The Epson 8350 has a 2.1:1 zoom lens on it which makes it very adjustable compared to the Optoma HD20’s zoom lens which is only a 1.2:1 ratio. The major limiting factor was my 8 foot tall ceiling and the room being 12 feet front to back. The required space and positioning of the DLP type projectors in my room just wouldn’t work out well. One other concern is that some people are sensitive to the DLP rainbow effect and I didn’t want something that’d work for some people and not for others. 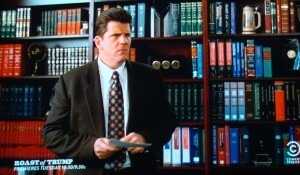 Who wants a guest that says ‘Just use the TV, the big screen really messes with my eyes’ or something to that effect? 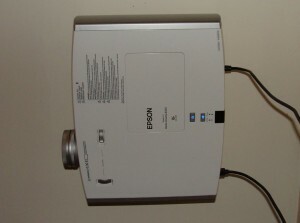 The Epson PowerLite Home Theater 8350. The projector and the mount came in the mail together but the projector screen I ordered an Elite Screens Pull Down Projection Screen, 16:9 Aspect Ratio-92in (Matte White) was shipped from the factory and won’t show up until later. 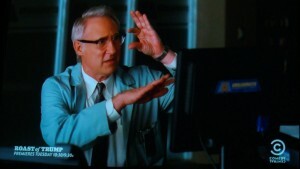 For the weekend I picked up an Epson Duet 80-Inch 4:3 and 16:9 Aspect Ratio Screen from Staples. They have a 14 day no questions asked return policy so this was pretty convenient for the weekend however I may decide to keep it as it’s a very nice and portable screen for a low price. If you’re interested in screens click the link to see my Installation and Review of the Elite Screens ELIM92UWH which may give you an idea of what you’re looking at to install a projector screen. 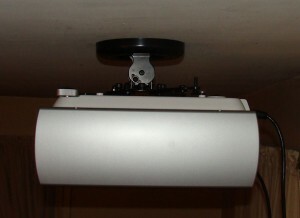 The projector installed easily to the ceiling once I used a stud finder to locate the joist in the ceiling to mount it to. The mount, which has to be purchased separately from a third party as it does not come stock with a ceiling mount, used two 3″ long lag bolts on either side of the ceiling plate and was easy to do. I put about a third of my body weight against it to make sure it would not pull out of the joist. It’s important to center the mount left to right with where you plan to install your screen and if you are using a DLP projector you need to read the projectors manual to get the mounting height as well. 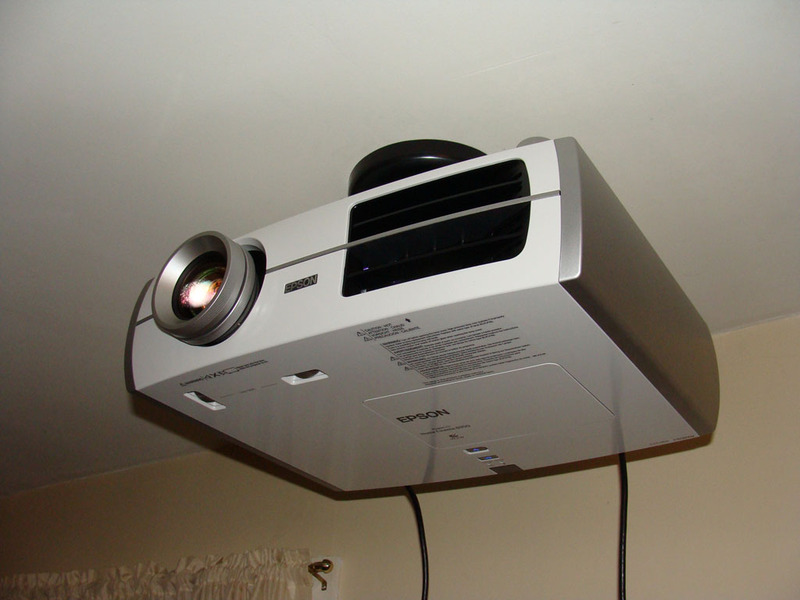 With an LCD projector that has the lens tilt feature the height is less important. One thing to keep in mind with a lens tilt feature is that if your display area is setup up properly, then a keystone correction feature is not required. This may sound totally crazy, but the front lens on the projector is heavily ‘bowed’ and moves in front of the other projection elements. 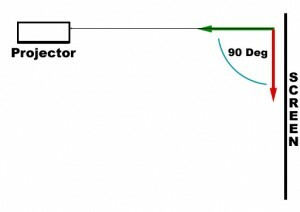 If your projector is to the right, or left or above or below your projection screen, as long as the projector is set at 90 degree angles, you’ll be able to adjust the image to the screen without the need for a keystone feature. There actually is a keystone correction feature, but it is reffered to as ‘automatic keystone correction’. The lens itself will deform and adjust the image to be square as you adjust the lens shift feature so if your projector is not centered on the screen, don’t try to point it at the screen, just make sure you have the projector and the screen at 90 degree sharp angles to each other, then use the lens shift knobs to move the image onto the screen, this will result in a square (edges are at right angles to each other) display. 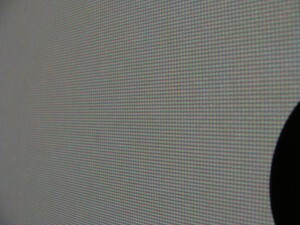 If the projector is off center, left/right or up/down and you work to aim it directly at the screen(a straight line from the lens to the screen), then you will cause a keystone effect. 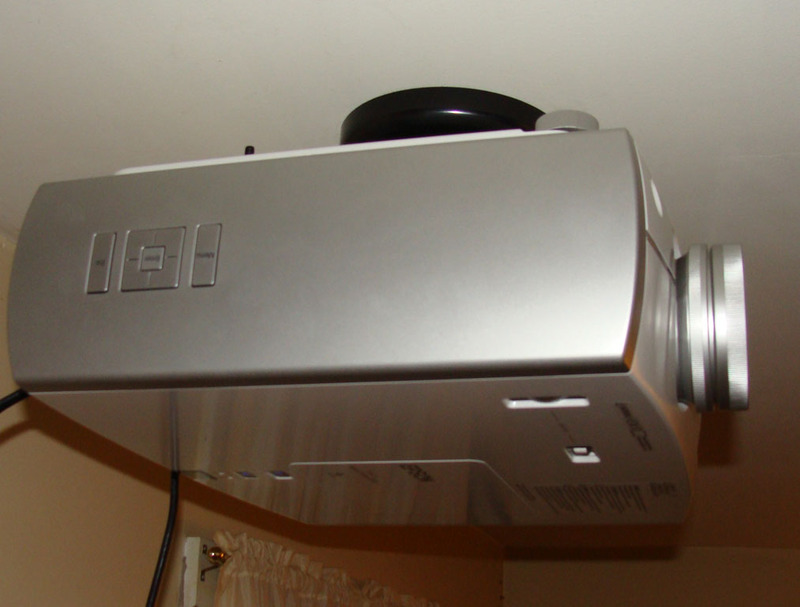 As I mentioned the ceiling mount was not included with the Epson 8350 projector and was bought third party, a Sanus VMPR1 . There are quite a few options for projector mounts with good ratings so I would either find one that fits your budget, has good reviews and fits the looks you want. If you’re mounting to a vaulted ceiling, make sure the mount that states it can be installed on vaulted ceilings, not all of them can. 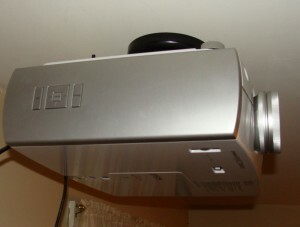 Below are a few photos of the projector mounted to the ceiling. 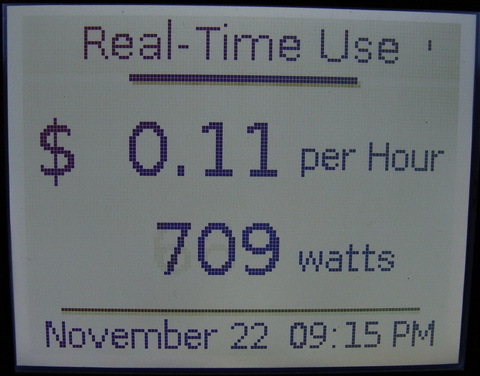 Note (8/21/2011): A reader asked via the contact form if the Sanus VMPR1 reached the mounting holes in the 8350. The 8350 had 5 mounting holes spaced relatively far apart. There’s 4 on the corners and 1 front and center. The Sanus mount has four arms but using the included extension it is connected to the 2 corner mount points at the rear of the projector. The front arms are then crossed over each other and attached to the front center mount point. A reader, GregC, emailed me about the mount I was using and I gave him some details, he decided to go with another type of mount and says he is very happy with it as well. The mount he purchased was the Sanus VP1-B1 for around $229.99 from Best Buy. He said the arms all reached the mounting holes on the projector and that it feels very secure although it cost a bit more. He’s been using his 8350 on a 92″ Stewart screen with the projector mounted 14 feet away from the screen and seems happy watching sports and movies on it. The remote control for the Epson 8350 is pretty squarish and clean cut, it’s not very stylish but it gives you access to all the settings that you’ll need to adjust the projector and for selecting your source inputs. The back light on the remote is orange and subdued so it won’t be blinding you while trying to watch a move and adjust things. The package I bought came with a 25 foot HDMI cable which I’ve been using to watch TV and Blu-Ray movies but I think it may come up a little short and I’m not sure if it is C2 (in wall) rated. I’m going to use this cable to connect my PC to the projector and I ordered a 35 foot heavy gauge C2 rated cable to run from the back wall, under the floor boards and up behind the entertainment center to the 4 input, 2 output (or 2×4) HDMI matrix switch I purchased but that’s for another post. I set up the Epson Duet screen in the front of the room before the 92-inch Elite Screens pull down arrived. The Duet barely fits in that spot but I do get about 76 of the full 80-inches out of it. The 92-inch Elite pull down screen I ordered is wider but since it does not require a floor stand it will be further back in the room and pull down directly in front of the TV so there should be no issues with the available space for the screen. I’ve taken some photos of the screen while watching TV, Movies and Blu-Rays and the quality has impressed me for being a ‘entry level’ projector as other reviewers mentioned it’s pretty good. The blacks could be blacker but that’s the only thing I really notice. The Epson 8350 is bright, sharp and very clear. 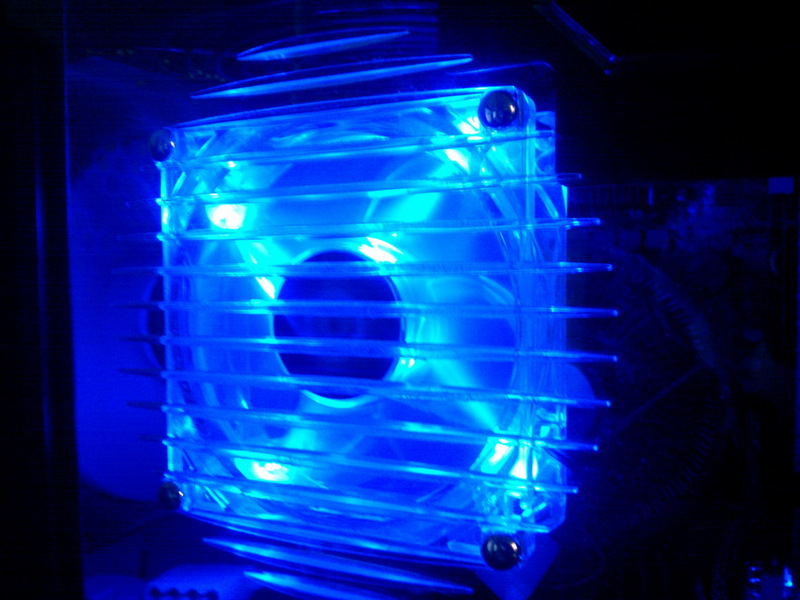 I’ve tried the setup for video games, particularly Battlefield: Bad Company 2 (PC) , and Need For Speed: Hot Pursuit (PC) and most recently Portal 2 (PC). The games are great on this projector! I am very satisfied with the performance and quality there as well though it’s a bit weird to play a game on such a huge screen at first and the detail is amazing. 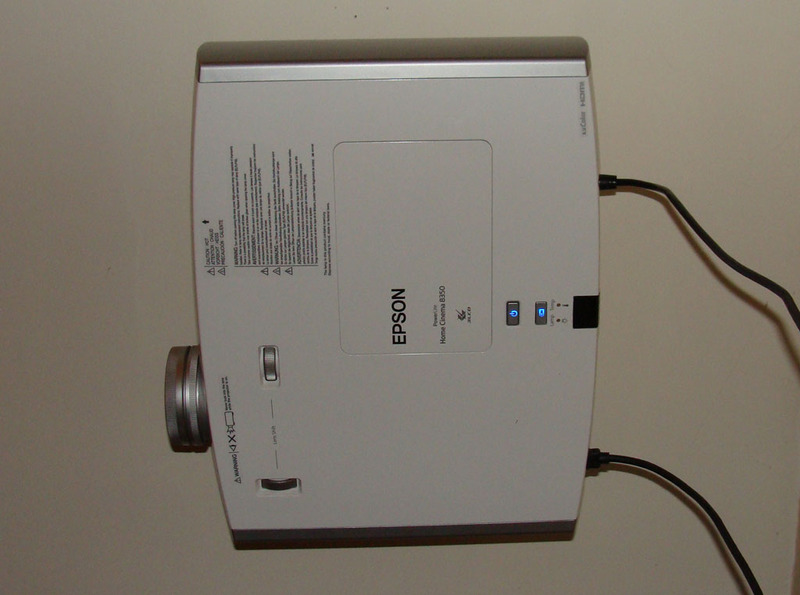 The rest of the photos below were taken of the Epson 8350 projector on the temporary Epson Duet screen. You can see the pictures I took with the 92″ Elite Screens screen installed on my Elite Screens ELIM92UWG Pull Down Projector Screen Review. The pictures were shot with my 8.1 megapixel point and shoot Sony DSC-H10 camera. 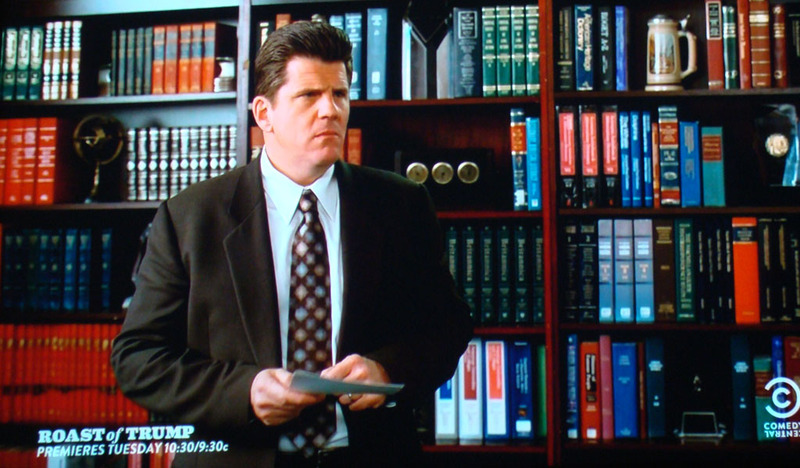 The Blu-Ray photos are the ones with a higher aspect ratio and are in 1080p the ones which look taller are shot from TV at 1080i with terrible compression from our cable provider. 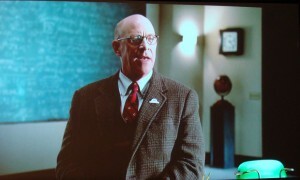 The photo below was taken of a TV commercial with the camera flash enabled. I wanted to see how bright the projector really was and I was surprised that the picture was still this visible even when saturated with a camera flash. Overall I’m very happy with this projector so far and I think I’ll be using it for a long time. The quality is stunning compared to the older projectors I’m used to. The brightness of the Epson 8350 is great and even during the daytime, if I have my shades closed the screen is still bright. The lamp is rated for 4000 hours in economy or standard mode which works out to be 166 days of watching your TV non-stop 24 hours a day 7 days a week. The projector doesn’t support 3D and for the most part you’ll need a more expensive projector if you want to do that. I’m personally not sold on the whole 3D effect as it doesn’t really look natural to me and while I ‘see 3D’ it’s really annoying 3D, so this wasn’t a feature I really wanted. Perhaps in the future new 3D technologies and as film directors gain more experience shooting in 3D things will improve, but I will buy a 3D projector when and if that happens. The projector makes a great home theatre TV for the price, compared to buying a normal 1080P HD TV. While prices on LCD TV’s have been dropping rapidly a home theater projector and screen is certainly worth a look and your consideration. It may not be for everyone but I wouldn’t dismiss the thought right away because you could be missing out on something great. The news looks great, TV shows look great, movies are incredible and gaming is a blast, especially with friends over. In the next week or two I’ll be running the HDMI cables in the walls, installing a 4×2 HDMI matrix switch and taking care of a few other supplemental things which I will be documenting on my site as well. 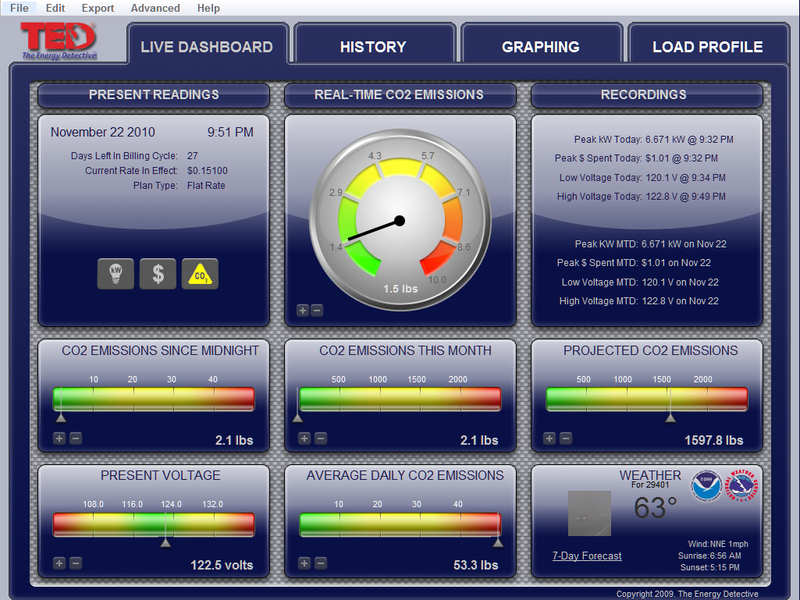 Update 8/13/2011: I’ve rolled the hour meter on the projector over 1500 hours. 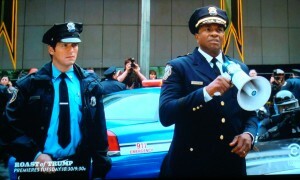 I’m surprised that I’ve had it on that long already, but it’s still putting out a great picture and reliable as ever. I’ve not run into any glitches or weirdities with this projector, it just works very quietly and in the background you don’t even really notice other than to turn it on or off. If you have any questions about my setup please let me know by commenting below this post. 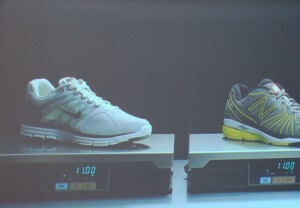 I would really like to see a picture of the projector mount feet attached to the projector. I’m having issues with the feet reaching the hard points on the projector. I’ll try and get a picture of it tonight for you and add it to the site. I attached two points at the rear diagonals using the extensions for the feet that were included with my mount and then attached one leg to the front center point of the projector, crossing the fourth leg over the top of that leg. A quick question, if the projector is not centered do you lose picture quality? 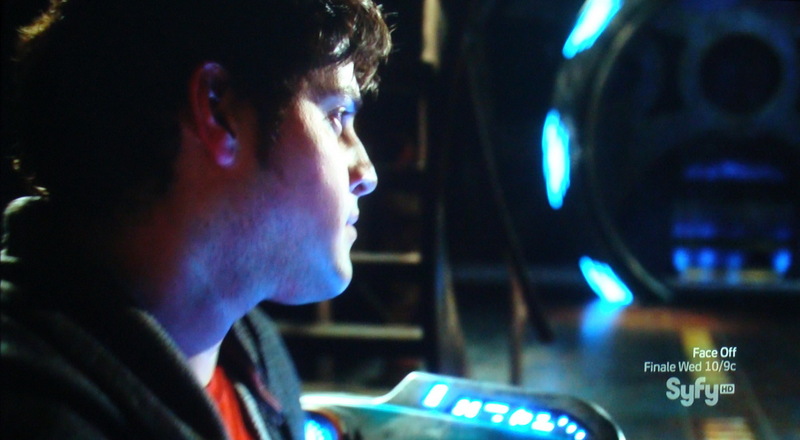 I know I am having the keystone effect but I am able to get over that, but if I am losing image quality, that is not good. They don’t really lose quality however your pixel spacing will be greater near the broad end of the image. You should be able to avoid keystoning if your projector has lens shift adjustments. You can also do keystone correction in the menus (this can cause loss of image quality) but not all projectors offer that. Excellent – Epson PowerLite Home Cinema 8350 got some great features!! Epson is a great brand that always comes up with fantastic ICT product range!! Nice specifications, especially its user friendly feature! I am intrigued by the 8350 but this projector only has lens shift and no keystone correction. With your set-up, as it seems similar to mine (8ft ceiling/12ft wide), what is the lowest you can project the image on the wall. I am not using a screen and because of a multipurpose use of this room, am limited on maximum height of the screen. Hi Mike, according to the documentation the lens shift allows you to shift the image by 96% up or down from the center of the projector. 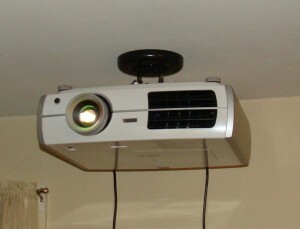 If the projector is mounted on the ceiling, with the lens and lens shift perfectly centered, the picture will be just a few inches below your ceiling. If you were going for a 100″ diagonal projection in 16:9 your image would be about 49 inches tall. so, you’d have about 24.5 inches of the image (the bottom half) showing on the wall with the image centered and 24.5 inches trying to project above the ceiling (it’d just be smeared across the ceiling of course). With the 96% adjustment you’d be able to lower the image down by ((49″ * .96) = 47.04″ ) 47″ inches. 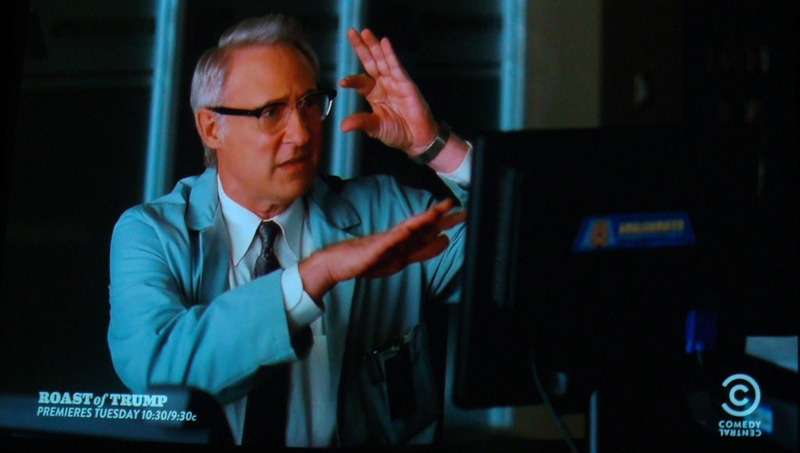 So you have 24.5 inches of image you need to get off the ceiling you can adjust the image down the full 96%(47″). If you move it down 47″ then you will have a gap between the top of the image and the ceiling of about 22.5 inches. Add a few inches to that because the center of the lens will not be right at the ceiling. In my case with the mount I used the center of the lens is about 10 inches below the ceiling surface so that would get added to that to be about 32.5″. Please keep in mind that with the lens shift you can’t do full left or right adjustment while having full up/down adjustment. If you do a good job measuring the center the projector then you should need too much left or right adjustment. Remember, center the lens of the projector on the center of your projection area, not the projector housing. I hope that helps There’s a diagram on page 25 of the user manual http://files.support.epson.com/pdf/plhc87u/plhc87uug.pdf that shows max up/down and left/right movement and any limitations. Very informative. Kepp in mind the great deals out there. I got this 8350 brand new non refurb from ebay on a make offer deal for $950 shipped! I got a brand new mout that works great at a garage sale for $10! oh ya, and an awesome dlite 92# screen with the felt sides from craigs list for $450! Great post. I came here looking for info on keystone effect for the 8350. I don’t have it mounted yet, just sitting on a table for now, but centering and lowering the legs – then adjusting via the lens fixed the trapezoid effect. Compared to the Epson 85HD, this smokes it. Colors are beautiful and rich,blacks are pretty dark and image is very sharp. I’m projecting on a home made 110″ screen and couldn’t be happier. It’s a little ghetto, but I’ll mount everything up in the next few weeks.